How many millions of dollars does it take to change a light bulb? While energy wonks have praised the innovation of Con Edison’s Brooklyn Queens Demand Management (BQDM) program, low-income communities and communities of color in the BQDM catchment area have seen little improvement to their daily lives from the $200 million program so far. 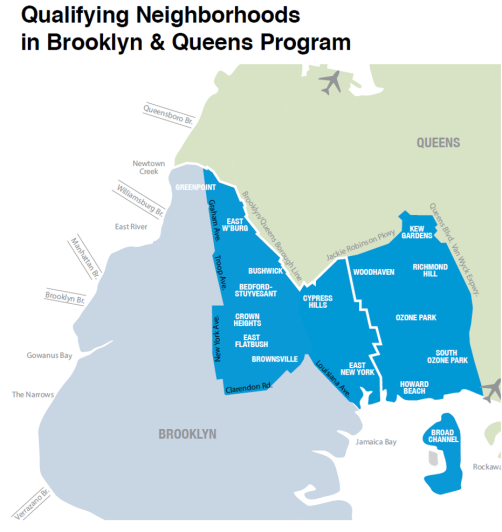 The BQDM was launched in 2014 to address a growing energy shortfall projected for 12 neighborhoods in Brooklyn and Queens. The main goal of the program was to reduce the energy demand by 52 megawatts (MW) total – 41 MW from customers and 11 MW from Con Ed. On the customer side, Con Ed’s quarterly reports for BQDM implementation show only about 5 MW-worth of program investments have brought tangible improvements for residential customers in 1-4-unit buildings and multifamily buildings. For those residential customers, upgrades have largely meant swapping out energy-inefficient light bulbs for LEDs, in most cases limited to common areas. Given the potential impact this $200 million program could have, Con Ed’s focus on the low-hanging fruit for energy efficiency solutions in residential buildings is a disservice to impacted customers. The BQDM area includes over 750,000 residents – 90 percent of residents are people of color and 76 percent have a median household income below $30,000. Many of these residents, particularly in Central Brooklyn, are disproportionately vulnerable to the impacts of extreme heat. These customers are also likely to pay a significant portion of their income on energy costs, which makes keeping cool in the summer very costly. Low-income customers, renters and customers with bad credit are excluded from many local and state energy efficiency and clean energy programs because they are unable to take on the associated debt. These vulnerable communities need more investment in solutions that not only reduce demand but also reduce energy costs. Widespread retrofits would keep homes cooler and healthier while investing in workforce development. The Public Service Commission recently renewed the BQDM program for an indefinite period, authorizing Con Ed to spend the remaining $50 million in ratepayer funds on additional upgrades. This sizeable investment to Central Brooklyn should go beyond light bulbs and instead focus on more long-term, visionary solutions that make the energy efficiency and distributive energy economically more accessible. Governor Cuomo – who has already acknowledged Central Brooklyn’s vulnerabilities and needs via his “Vital Brooklyn” initiative – should work with the Public Service Commission and Con Edison to include low- and moderate-income communities in a just transition to the renewable energy economy by piloting the PAYS® model in the BQDM. Report on Alternative Approaches to Providing Low- and Moderate-Income (LMI) Clean Energy Services, Section 7.4 Finance and Access to Capital.